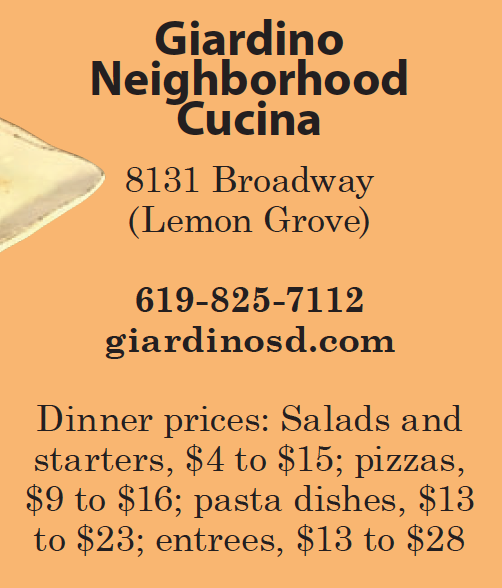 As the Sunday dinner hour hit, streams of customers began arriving to Lemon Grove’s new Giardino Neighborhood Cucina to experience Italian cuisine crafted by a young, ambitious chef whose mother taught him to cook at age 13 in his native Sicily. In little time the place was full. “I chose cooking over playing video games when I’d get home from school,” recalls Marco Provino, a 20-something who was executive chef at Osteria Panevino in San Diego’s Gaslamp Quarter before opening the exquisitely designed Giardino in mid-November with his radiant Russian wife, Karina Kravalis. She works the front of the house and helped makeover what used to be a Mexican restaurant. The roomy interior captivates with warm lighting, brick and chalkboard walls, and floral wallpaper from Switzerland framing a window in the back that looks into a private dining room. Amid ample seating is an orange 1972 Vespa parked between high and low-top tables, a whimsical touch that fits artfully into the scheme. There’s also an inviting L-shaped bar stocked with organic Italian beer and wines from Italy, California and the Northwest. Cozy and embracing, it’s exactly the kind of restaurant every neighborhood deserves. 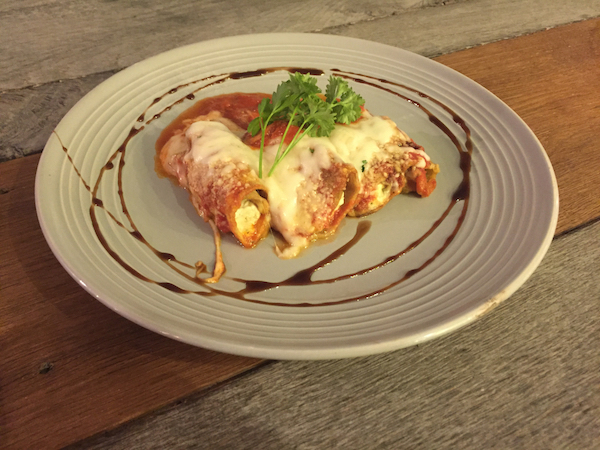 Provino’s menu features straightforward Sicilian dishes as well as northern Italian recipes laced with rich cream-based sauces. The former shines a spotlight on breaded rib eye served with seasonal vegetables, and pizzas that defy the thick, stereotypical Sicilian style we all know. These, however, are what you’d find in Sicily’s capital of Palermo, which flaunt thin, crispy crusts slightly burnt in spots to give them a delicious chary essence. We ordered “The Queen,” a margarita pie made “the way it’s supposed to be,” as stated on the menu. 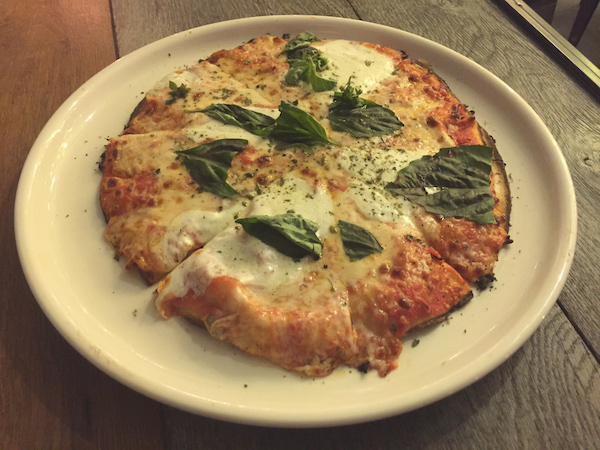 Despite its uncomplicated topping of light tomato sauce, buttery mozzarella and fresh basil leaves, it carried the savory excitement of a pizza studded with twice the number of ingredients. Leading up to the pizza and two entrees, we began with the house salad using mixed lettuces sourced from a Lemon Grove farmer. Sweet cherry tomatoes and a rather heavy hand of house-made Italian dressing added a high level of perkiness my companion favors. I prefer under-dressed greens. 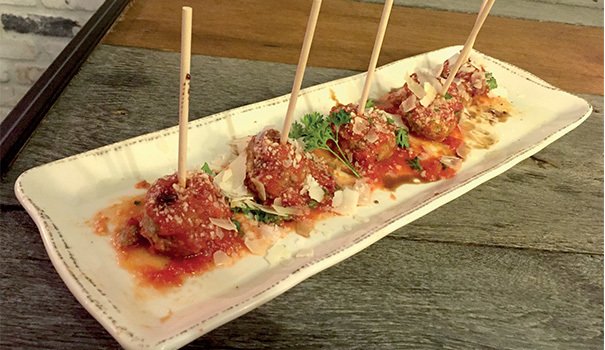 An appetizer of meatball lollipops (five to an order) featured loosely formed orbs of beef, pork and veal draped in bright pomodoro sauce. They went down as easily as an order of eggplant rolls filled with herb-speckled ricotta and mozzarella. The thinly sliced, lightly fried sheets of eggplant were delightfully firm and flavorful rather than watery and insipid like they can be without proper treatment. It was one of our favorite dishes of the evening. Other starters include steamed mussels and clams in white wine sauce, calamari fritti with garlic aoili, crab-stuffed mushrooms, and the Sicilian invention of saffron-kissed rice balls with peas known as arancini. They’re served here with Bolognese sauce and pesto aioli. Pasta carbonara is a Roman dish featuring an egg yolk-based sauce that doesn’t show up in too many Italian restaurants because of its tricky nature. If overcooked or held on a serving line too long, the sauce turns into scrambled eggs. Provino’s version escaped that horror. And he gives it a Milanese spin by adding brandy-spiked cream to a sauce that’s already wickedly rich from sauteed bacon and the egg yolks. 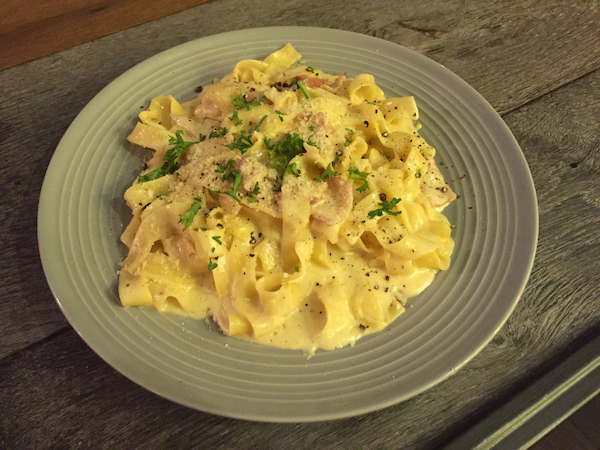 Tossed into ribbons of his house-made fettucine, it was one of those divine dishes that was well worth the few extra hikes I took to burn off the calories in the days following. My companion opted for a cholesterol bomb too – the pork belly roll flecked with spinach and pancetta and served over mashed potatoes with mushroom-cream sauce. We were shocked at the hefty portion of belly, which featured a wide layer of the prized melt-in-your-mouth fat coiled around a strip of firm and fleshy meat in the center. Impossible to finish, given the other dishes that came before it, he toted half of it home. 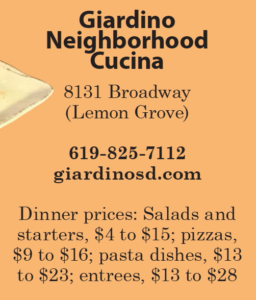 Tempted by the house-made tiramisu and outsourced limoncello cheesecake, we skipped dessert and left behind a bustling and convivial atmosphere, which I’m predicting will endure on this quiet end of Lemon Grove’s commercial district.